The carefully crafted curved rocking foot ensures a smooth ride while the traditionally styled high-back vertical slats provide complete support. 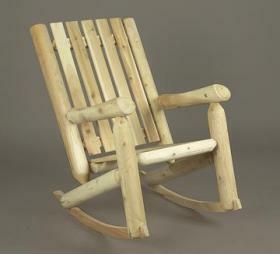 This elegant rocker is smooth-sanded and lightweight so you can take it with you as follow the sun. Solid cedar construction ensures years of carefree use. Cedar is also naturally resistant to decay, insect, and weather damage and, when left untreated, the creamy natural color weathers gracefully to a silvery grey.